Hello, all! 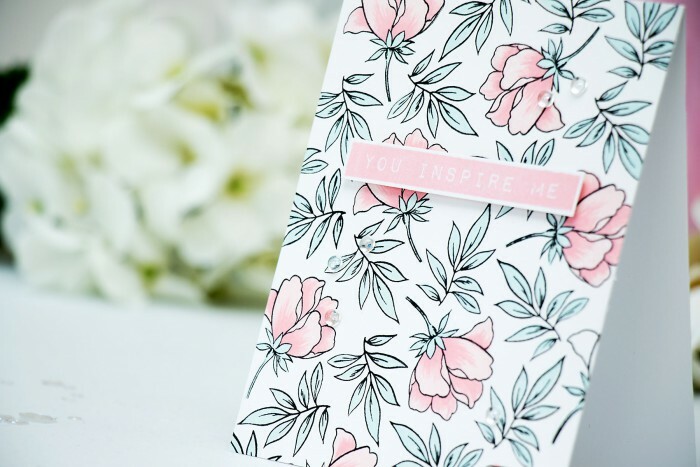 A few days ago I shared a post on Altenew Blog focusing on using the most gorgeous Peony Bouquet stamp set from the January 2016 release. Its a large 6×8″ set that offers you beautiful color layering options – you can create stunning colored-like flowers and several colored-like leaves. Its a perfect set for those of us who struggle with coloring, yet want to incorporate beautiful colored images into our projects. I have several cards to share today using this fabulous set. 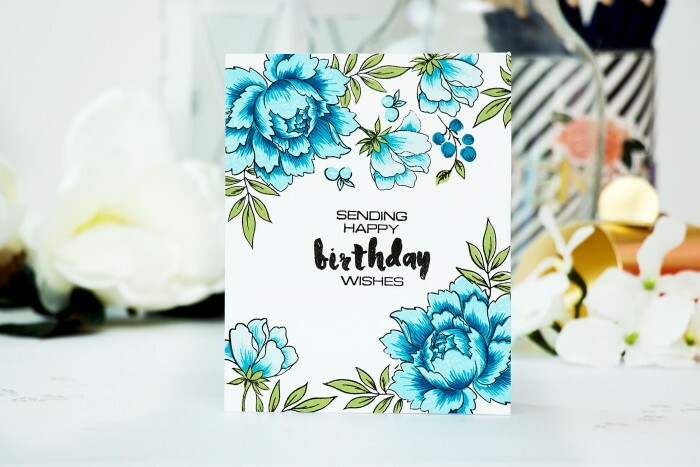 Sending Happy Birthday Wishes – its a one layer project created using a bit of masking. This card looks like its very time consuming, although it doesn’t take more than 30 minutes to make. Begin by stamping sentiment using black ink (I combined fonts from 2 different stamp sets – Painted Greetings and an older Beautiful Lady set), the stamped sentiment will guide and direct the rest of the stamping on this project. Next you’ll need to create a mask for the largest flower, I made mine out of thin printer paper, but masking paper or post it notes work well too. Stamp two large peony outlines in black, mask and stamp the leave outlines and smaller flowers, add additional flower outlines and leaves. 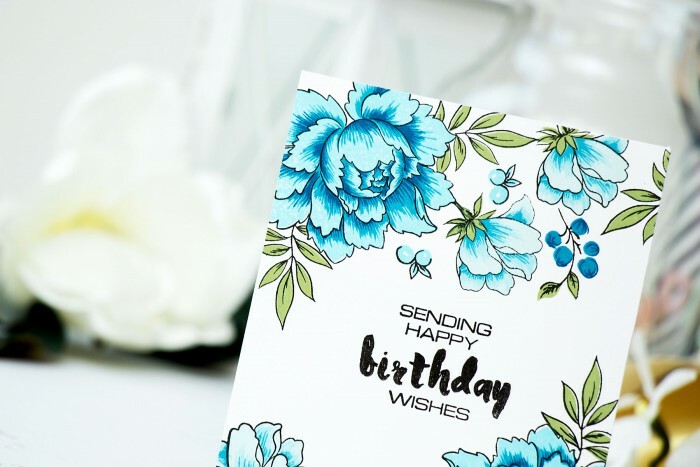 Use blue and green inks to “color” the images using corresponding layers and watch how easy these images come to life. 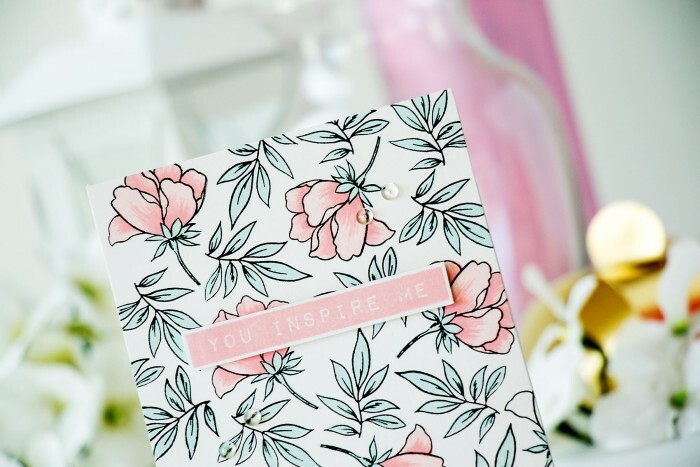 My second project, You Inspire Me, features a simple stamped floral pattern done in beautiful pink and blue pastels. Very easy to create, doesn’t require any masking. First I stamped the small flower and the leaf outlines using black ink, I didn’t overlap my images, but I tried to angle them differently to create movement on this project. I used very light pinks and lightest blue inks from Altenew to “color” these. For the sentiment I went with a very simple You Inspire Me stamped using Cotton Candy ink. I also added a few little clear droplets as additional accents. My last project for today is a little bit more complex, although still easy to make. 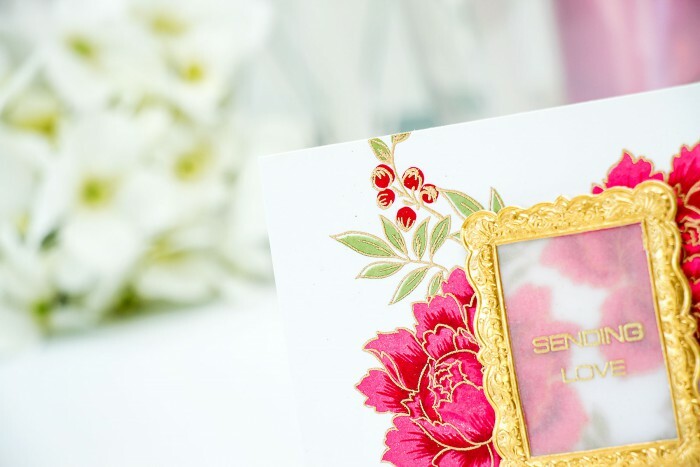 The image outlines for this card were heat embossed using Gold embossing powder to match the gold frame that houses the sentiment. 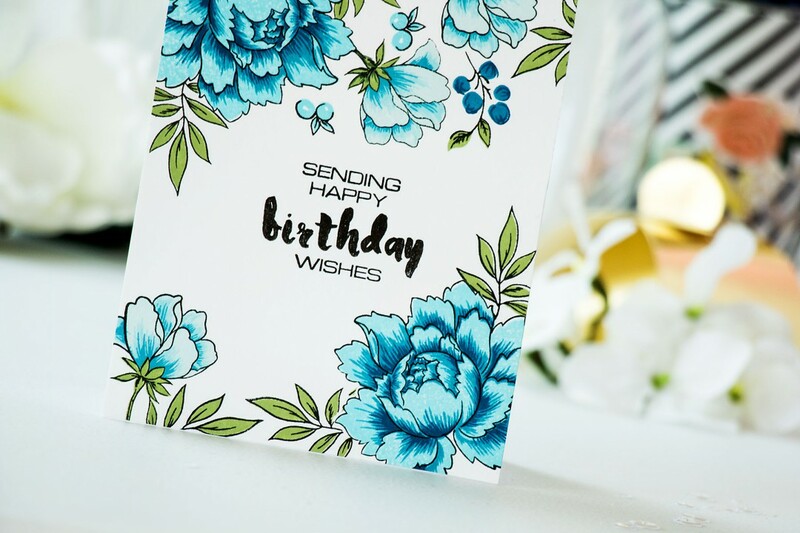 First I stamped the layers of the images (without the outlines) and only after my stamping was completely done I added the gold heat embossed contours to the flowers and leaves. This resulted in a slightly offset look. 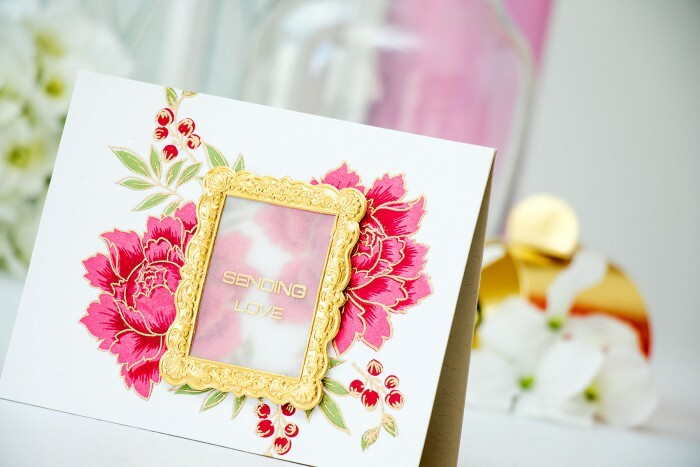 The sentiment, Sending Love, was heat embossed in gold onto a piece of vellum and was adhered onto the gold frame and foam mounted onto the card. So this finishes my today’s post. 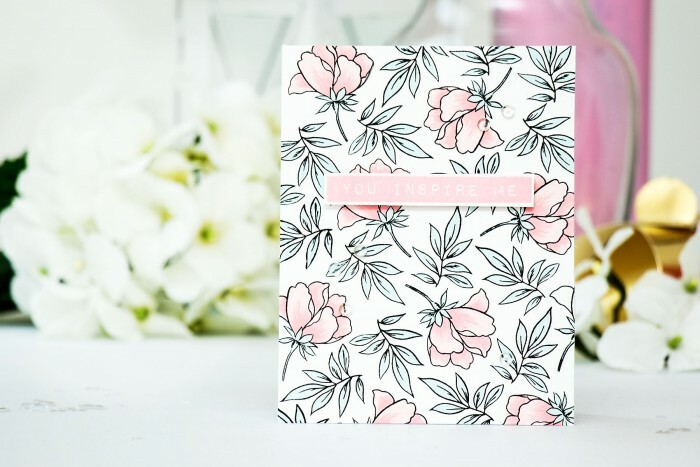 I really believe the Peony Bouquet is one of those must-have floral stamp sets, it’s easy to use, it has multiple uses and it always produces gorgeous results. Thanks so much for stopping by today, see you soon! Gorgeous cards. I especially love the first one. Beautiful cards Yana. I love the peony stamp set. I hope I will be able to get one here. Thanks. These cards are beyond beautiful!!! Knocked my socks off! I love the peony stamps, too! Your cards are always so exquisitely beautiful!! thank you, Joy! Glad you love these! 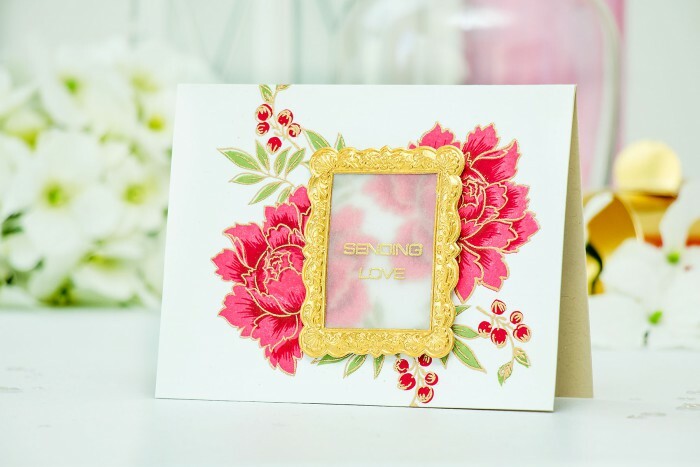 These cards are beautiful, Yana – positively swoon worthy! I love all these cards but the one that really caught my attention was the last one. I just love the gold frame and vellum to break up the beautiful image underneath. So classy. thank you! I love to use Altenew trims like this, they are just fantastic! I just wanted to say thanks for the inspiration. I had a digital stamp I wanted to use but wasn’t sure how to do that. I can’t stamp/color well so I adapted by cutting out the digi stamp and gluing it on the card. Thanks again.